As anyone who reads my posts will know, one of my favourite aspects of living in Berlin is the insane nightlife, which is arguably unrivaled anywhere else on Earth, and has resulted in recent waves of revelers from across Europe flocking to the German capital for the sole purpose of dancing the weekend away at one of the iconic techno clubs. Whilst it is true that the clubs here and the attitude towards nightlife which permeates the entire culture of the city are unlikely to be found in any other city and make it arguably the best destination for a year abroad, there are also several drawbacks to this very specific type of nightlife, which whilst being key factors to the unique nature of the party scene, can also prove detrimental to it in ways that the scenes in other cities are not. Here I’m going to list some of the defining aspects which are largely unique to the nightlife here in Berlin, whilst weighing up the pros and cons of these aspects from my own experiences of going out pretty much every weekend. Whilst there are many smaller clubs in town which probably have a door policy not too dissimilar to the O2 in Leicester (as long as you can stand up, you’re in), many of the better, more lauded clubs which tend to throw the best and longest parties are much more selective about who they let in. Some of the clubs with notoriously strict door policies include Watergate, About Blank, KaterBlau, Chalet and of course the infamously impregnable Berghain (regularly labelled the best nightclub on Earth). Whilst the decision making process of the bouncers who guard these clubs may seem arbitrary to the uninitiated, any local who has spent two hours queuing outside these places most weekends will be able to tell you that the factors which will gain you access to these places are: be quiet in the queue, DON’T be drunk, dress in dark muted colours (or dress very eccentrically, in a leather gimp suit or neon kimono, there is no in-between), arrive in a small group (preferably less than four people), know which DJ is playing that night (this is how they separate the bridge-and-tunnel crowd from the real techno-heads who are just there to dance), try and speak German if you can and most importantly, be respectful. The main cons of this aspect of clubbing are that it can be very disheartening to have gotten all pumped up for a particular party, only to be staunchly told “nein” at the door after standing outside in the rain for an hour (which happened to me on my very first night out in Berlin outside OHM Club). It can also make you resent a venue for seeming somewhat exclusionary and hypocritical for espousing egalitarian values of uninhibited fun-for-all whilst simultaneously rejecting people for wearing the wrong outfit or holding the wrong passport (many clubs are also regularly accused of racism for the apparent lack of diversity on the dancefloor). However the main pro of this policy is that it is vital to maintaining the unique atmosphere of the clubs, as drunk idiots, annoying tourists and people who don’t appreciate the music are effectively filtered out, leaving a club with a very fun, achingly hip vibe that you can’t find anywhere else. Also, nothing quite beats the feeling of getting past the bouncer into one of the clubs with notoriously difficult door policies, which were clearly also designed to massage the egos of the chosen few. Diverse nightlife? Techno, techno and more techno. Whilst the fact that I am a die-hard fan of techno music has probably resulted in a touch of editorial bias, it needs to be noted that whilst you can obviously find a venue for every taste in this city of 3.5 million people, all the biggest and best clubs focus primarily on techno music, and you will have some trouble finding parties of similar quality specializing in other genres of music. 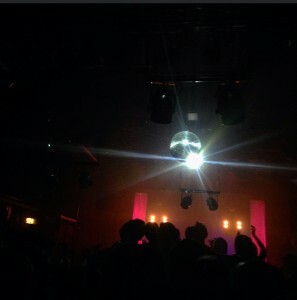 The fact is that techno is a central part of the culture of the city which dates back to the fall of the Berlin Wall in 1989, and is something that is so uniquely Berlin that there is very little room for outside competition, therefore many of the clubs which cater to say, RnB or Pop simply don’t last very long here. The main Pro of this is that if you’re a fan of techno or electronic music in general, then Berlin is heaven on Earth. Also if if you aren’t a fan, it is very likely that the jaw-dropping parties and bone-shattering sound systems within the techno clubs will likely make you a convert, as several recent visiting friends could testify. The Con of this is that if you really do not like this kind of music, you are unlikely to be able to experience the best aspects of Berlin nightlife, which is a shame. It is no secret that the highly permissive nature of the nightclubs here is a central part of it’s reputation for no-holds-barred fun and debauchery, with willingly relaxed search policies at the door as well as many of the clubs unofficially allowing dealers to operate within (presumably in exchange for a cut of the profits), and whilst I do not judge people indulging in whatever vice they want, there are undoubtedly both good and bad aspects of Berlin’s attitude toward drug consumption. The major cons of this are both obvious and subtle – the main one for me being that the knock-on effect of this policy has resulted in an explosion of very intrusive street dealers across the city, especially in my neighbourhood of Friedrichshain and neighbouring Kreuzberg. There are certain areas where it is now almost impossible to walk down the street without getting harassed by intimidating groups of men trying to sell you drugs – an unfortunate knock-on effect of such a liberal policy towards drug use in the city and the vast amounts of money that can be made from catering to partygoers (note: if you do want to do drugs in Berlin, DO NOT buy from any street dealers, as the product is likely to be cut with various toxic additives). Furthermore, whilst this tolerance has largely resulted in fairly moderate and safe use among clubgoers, you will sometimes have the odd person (usually a tourist) who will take it too far and have to be stretchered out of the place. The Pros of this are that generally, the drugs consumed in the city are generally safer and of higher quality (assuming you don’t buy from street dealers), meaning that those who choose to indulge are less likely to be putting themselves in danger. Additionally, the high percentage of club goers on safer party drugs such as MDMA is arguably very preferable to a club full of aggressive drunk idiots.